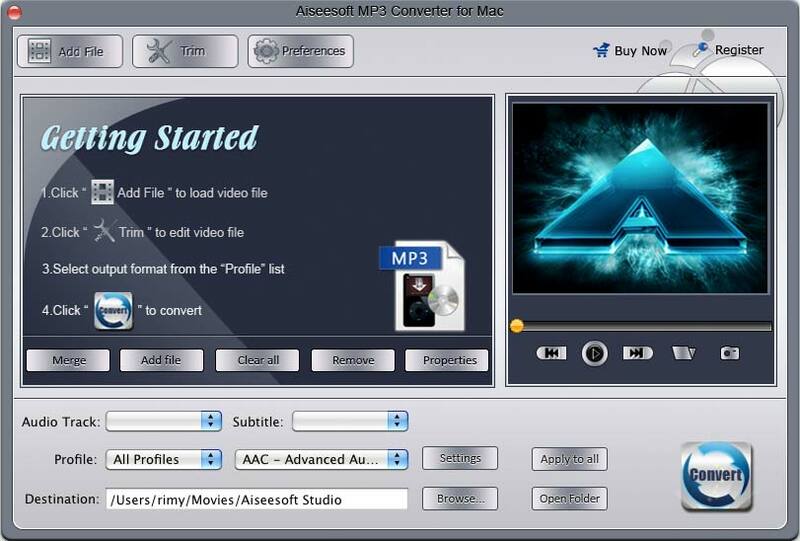 Aiseesoft MP3 Converter for Mac program is very Mac friendly so that you can run it on both Intel Processor and PowerPC. Mac MP3 Converter can read most popular video formats and convert them to MP3 like convert MP4 to MP3, acting as MP4 to MP3 Converter etc. Mac MP3 Converter is capable of converting almost all popular audio formats to MP3 especially convert WAV to MP3, convert WMA to MP3, convert OGG to MP3 Mac etc. Own the way to capture your favorite picture from input video to suit for your needs by pressing 'snapshot' button. Free to select a range in the video or audio clips by inputting certain time number in Start Time and End Time fields manually and click "OK". The Select Length will appear. Qweas is providing links to Aiseesoft MP3 Converter for Mac 3.2.06 as a courtesy, and makes no representations regarding Aiseesoft MP3 Converter for Mac or any other applications or any information related thereto. Any questions, complaints or claims regarding this application Aiseesoft MP3 Converter for Mac 3.2.06 must be directed to the appropriate software vendor. You may click the publisher link of Aiseesoft MP3 Converter for Mac on the top of this page to get more details about the vendor.